How are you today? I am incredibly happy today, in fact I’m as happy as I could be to be hosting Jeanna Ellsworth on her first post for the launch of Hope for Mr. Darcy which was released two days ago. Hope for Mr. Darcy is the first volume of the Hope Series Trilogy, a Regency variation series based on Jane Austen’s Pride and Prejudice. This trilogy promises hope and will always light our way through the darkness of unrequited love, but eventually bringing tremendously gratifying outcomes for our three favorite characters: Mr. Darcy, Colonel Fitzwilliam, and Georgiana Darcy. I’m looking forward to read this book as Mrs. Ellsworth previous books are amongst some of my favorites, namely Mr. Darcy’s Promise that I have recently reviewed. I hope you get as enthusiastic about it as I am after reading the book blurb and getting to know it’s main character a little better. That’s right everyone, Mr. Darcy himself visited from Pemberley to Milton and allowed me to ask him some questions. Let me remind you that he came to visit just after he had been refused by Miss Elizabeth Bennet, and I might have been a bit impertinent for his taste, so his temper might not have been very tempered at the time. In fact, he had to leave and return a little later to finish the interview. But I won’t take your precious time anymore, I will leave you to read the interview and see for yourselves the state a man who has just been refused finds himself in. Welcome to From Pemberley to Milton Mr. Darcy! It’s an honor to have you here sir, especially as I’ve been told this is a particularly hard time for you. I don’t mean to intrude, but I can’t resist the temptation to ask. What is it like to find your soul mate, or what some people call your touchstone, your one in five billion, and lose it before she was even yours to lose? There really are no words to describe the torment. It is as if you truly have nothing and never did, nor will you ever have anything of value again. I am Fitzwilliam Darcy, a gentleman raised without needs. I have never had a desire long enough to know how to define it. But Elizabeth, pardon me, Miss Elizabeth––I still have a hard time thinking of her in any other way but intimately––she . . . she changed that for me forever. The only need I have ever had, the only thirst that has ever tortured me, will never be quenched. I am sorry for being so frank, but why give up so easily? Fitzwilliam Darcy is not a quitter. Where there is love, there is hope. How far will you chase that hope and turn it into reality? Hope? Ha! Pardon me, a gentleman should never scoff like that. Do be serious! My reaction to that question makes me just shake my head in disbelief. You think I should try again? I was refused! I haven’t been refused anything! Not in all my eight and twenty years . . . Nothing . . . ever. Are you well, Mr. Darcy? You sighed just now and stopped talking. Would you like some wine? Oh, yes, actually, no. What I mean is, no, I do not need wine, and yes, I am well, strangely so. Forgive me. I allowed myself to ponder that question a bit more. The idea that I might have a chance, and truly, if the chance was one in a million, I have to admit I would take it! How odd this feeling is. Hope. You are smiling, sir. But you did not answer the question. How far would you go? Well, for starters, my cousin, Colonel Fitzwilliam, just told me she was ill. He has been begging me to go see her at the parsonage. It was only this morning that I gave her the letter in the grove. I needed a minute to consider it before I answered him. I remember thinking, could I really be in her presence so soon after she refused me? The wound is still raw, so terribly raw. You have to understand that. But, I have to admit, I am considering it. I tend to journal my thoughts sometimes. Would you like to hear my exact thoughts from that moment? Of course. What a privilege. There is no hope for Mr. Darcy? Might I parrot your sentiments from a moment ago; do be serious! Are you worthy of her if you are not willing to fight for her? What kind of man would give up hope? I am sure what I said was not what you were expecting. I suppose we all have suffered some disappointment today, I know I have. Perhaps we should end this. I hate to say it, but this has been a very difficult interview. I suppose you see a prideful man too. I truly thought I had been sufficiently humbled yesterday when miss Elizabeth refused me. Yet, your probing, your sword of honesty has been a direct hit. I am being interviewed, questioned in every way, and the impertinence is quite foreign for me. Ha, well, perhaps not so foreign. Why did you just chuckle? What is so humorous? Do you mind if I postpone the rest of the interview? I find my mind is not engaged at the moment, at least not with you. I find a small rector’s cottage on the northeast corner of my aunt’s property has completely overtaken my mind. I shall return. Welcome back, Mr. Darcy. Oh my, I do not believe I have seen you smile so charmingly. It is late, but I see you have returned from the parsonage. But from the look in your eyes, you are ready to burst forthwith. Do not let me stop you. Thank you Mrs. Deodato. You are absolutely correct! I did it! I went and saw her! And although feverish, and perhaps a little delusional, something was there. ––Something to hope for? Oh dear, forgive me, I did not mean to make you emotional. Here is a fresh handkerchief. Yes, you took the words right out of my mouth. As miniscule as it sounds, there was something there. It can only be described as hope. It was amazing, truly unbelievable. She fell asleep shortly after we talked, for she is truly ill, but then this happened. May I share again what I have written? If you do not, you will have several disappointed people. Thanks you. After she fell asleep on the chaise, while we were waiting for the apothecary to come, this happened: “Darcy slipped his hand into hers just as her eyes closed peacefully. Colonel Fitzwilliam handed him a cool washcloth, and Darcy wiped her brow with it again and again. After a few minutes, her breathing slowed, and it was clear she had fallen asleep. Darcy took a deep breath. These last moments with her had been the most pleasant interaction he had ever had with her. She was confused and feverish, but she had been kind and concerned about him. And for the first time, he had been honest and open with her. He had nearly forgotten anyone else was in the room. Just then, as if determined to not be forgotten, Colonel Fitzwilliam loudly cleared his throat and curiously eyed Darcy’s hand clasping Elizabeth’s. The expression on his face spoke silent volumes. Darcy suspected that his cousin knew the whole truth now, and that irritated him somewhat. But that was Richard’s way. He investigated and searched out answers much like a lawyer who twisted and turned his witnesses until the truth burst forthwith in an onslaught. Yes, Richard wanted him to lay his cards out on the table. But this wasn’t any card game. His very heart was lying on a chaise, with new beads of sweat on her brow, gently reaching out to him with her tiny limp hand. He didn’t have time to explain himself to Richard. He wiped her brow again and rubbed the cloth along her forearms down to the hand that he held. Every brush of the cloth seemed to calm her. She gently squeezed his hand. Whatever was ailing her, she seemed to find comfort with him there holding her hand. He could do that much. He would be happy to do whatever she desired. With a pang of anxiety, he paused with the cloth and wondered just how delirious she was. Was he taking liberties with her? Her words from yesterday still stung . . . “the last man in the world I could ever be prevailed upon to marry.” He heard Mrs. Collins pass by on her way to the front door, welcoming the apothecary. He leaned down and kissed the back of her hand and then folded her arm against her chest and reluctantly left it there. What powerful prose. I can only imagine how light your heart felt with her asking you to stay. I am afraid our time is almost up. I want to thank you for your private feelings you have shared with us today. Is there anything else you would like to share with us before we end? Most definitely. You cannot be more shocked than I was, but, Miss Elizabeth responded to the letter from this morning. She wrote me a letter in return! It is far too personal to include in this interview, but I will share my reaction after I read it. Allow me to share one more excerpt, if I may. “Darcy sat back and relaxed a bit. It was a good letter; it offered him a bit of peace. There was much to be thankful for. He folded the letter and took the lantern and stood up. As he walked to Rosings, his step had a bounce to it. His eyes saw all the many paths that he and Elizabeth had walked over the last few weeks. Each moment that he had found her on her walk, he had never once imagined that she thought ill of him. But she did. At least back then. He smiled slightly. But perhaps she felt differently now. He reminded himself that she was feverish and confused, and that her kindness and civility towards him might not represent how she truly felt. But the letter still affected him, even more powerfully than holding her limp hand or cradling her sleepy head on his shoulder. How did you do it? Few people have the strength of constitution to independently draw the line for themselves between defeat and perseverance. Did Elizabeth’s letter really affect you that intensely? Most definitely. I cannot say more. It has been a long, taxing day. Thank you for pushing me in this direction. She is worth fighting for. She is my love, my life, the love of my life. Wow, that just left me speechless. I won’t take more of your time Mr. Darcy! Thank you so much for visiting From Pemberley to Milton, and good luck with winning Miss Elizabeth’s heart! Mrs. Ellsworth would like to celebrate the release of Hope for Mr. Darcy by offering one copy to one lucky reader at From Pemberley to Milton. The giveaway is international and the winner may chose a paperback or an eBook copy. 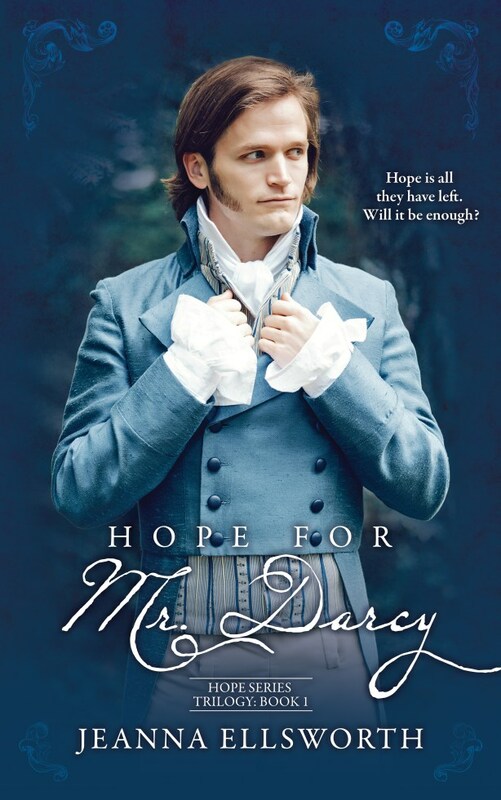 Leave a comment on this post and share your thoughts on Hope for Mr. Darcy with us until the 8th of May and stop by on the 9th to see who was the winner. Great interview Rita. I’m so jealous that you got to see and chat to Darcy 😞. But thanks for sharing the experience. I’m looking forward to reading this so fingers crossed I get lucky in the giveaway.. I have been interested in this series since I saw your post about the book covers! This was a great interview with Mr. Darcy. A rare opportunity indeed. I have loved each of Jeanna;s books and this will be no different, I am sure. The excerpt Mr. Darcy shared has piqued my interest even more. I already purchased the ebook, so please enter me for the paperback. Thank you for the generous give away. Mr. Darcy rarely is public with his tender heart, that is for sure. But the thing I love about Darcy is he is a passionate man. I suspect he had to have some way to transcribe his feelings. Goodluck in the giveaway! Thank you for the sweet words! Lovely interview! I certainly hope there is hope for Mr. Darcy! Thanks for sharing ladies. Rita, you are so lucky to be able to spend time with Fitzwilliam Darcy! Is he as handsome as I believe he would be up close and personal? BTW, I loved your “impertinent” displays… He needed them! I have to agree, the man couldn’t see past his nose! Rita was so good to give it to him straight. I am sure that few people talked to him that way, but we all know that most of us reserve the brutal honesty for those we love the most. And we know Rita loves him the most! We know he doesn’t like lies, so he should be able to handle the truth. Good luck with the series. I hope, no pun intended, to read it sooner than later. So do I! That’s probably why I like you so much Rita! I’ll fly over anytime you have him back! The whole book stemmed from my own intense emotion overtime I read or watch the Huntsford proposal. I just cringe inside knowing that the man’s heart is about to be broken. The interview was so good! I would love to read this book whether I win the giveaway or not! You have no idea! We started editing them almost 10 months ago! I wanted to edit all of them thoroughly all the way through before publishing any of them. I could just imagine us publishing the first of the series and finding a plot error in book 3 that we could no longer fix! But i’m so excited to share them with everyone! Good luck! Oh boy, you lucky gal to actually spend time with Mr. Darcy and look how you got him to talk, clever. I definitely want to know more about this situation. I am amazed you stayed so calm and collected and was able to ask such deep probing questions! Loved hearing his responses and reactions to them! Thank you for the chance at the giveaway! It was a very enlightening interview for both of them I think! Rita’s questions might have made him pause, and possibly even flinch, but those are the moments we realign our priorities! Good luck in the giveaway! It is all about appearances Carole! Deep down I was truly nervous, but I put my master of Pemberley mask and no one could tell what I was really feeling :)) Good luck in the giveaway! So cute! May I keep him? Tee hee hee. He is for sale! Are you posting the whole trilogy? I may wait to have it all together! I know how it is to have to wait for the next book, so I purposely planned on publishing book 2, Hope for Fitzwilliam, in three months, and then book 3, Hope for Georgiana, 3 months after that! So Potentially you could have them all in 6 months! I haven’t yet figured out how to do a boxed set kind of thing. Can’t you do it faster? 6 months is a loooong time! LOLOL truly! I’m sorry! But soon the next one will be on preorder . . . does that help?? Wow, how lucky were you Rita? An interview with the man himself. Thanks to both of you for sharing these thoughts about his ‘situation ‘. I’d love to be entered into the draw for a paperback version. Great interview but why, oh why, are you keeping him to yourself. Sharing is caring. Please enter me in the drawing. Thank you! Meow. I guess sharing is overrated now that it might be my turn. Oh dearest, I care sooooo much! I will SHARE SHARE SHARE! My Darcy is YOUR Darcy! I have to admit, I’m a little partial to my Darcy’s. Enjoy him time and time again! Wonderful interview! Fascinating hearing the man himself explain his thoughts and feelings! I can’t wait for the book itself! Please enter me in the drawing. LOL thanks! It was sort of fun to get into his mind and heart a little in this incident. And probably the truest thing he said, was “there are no words”. How do you describe the heartache he must have felt? Thanks for the giveaway opportunity! Can’t wait to read the book! I do believe that given the chance to interview a fictional character, I think Mr. Darcy would be ranked #1! He is no intense and is the perfect example of how “still waters run deep”. Good luck in the giveaway! Great interview 🙂 Please enter me into the drawing. Thanks! And you bet I’ll enter you in the drawing! Cross your fingers! Great news, I’m totally excited to read the book and I thought your blog terrific! I’m so glad! To sit down with Fitzwilliam Darcy . . . shhhhhh, what an opportunity! Rita is so blessed. I imagine not only does he rarely give interviews, but he also has probably never been so candid! Thank you so much!!! It makes me so happy to know readers like my blog :)) thank you, thank you! Loved the interview! <3. I can't wait to read this one! Thanks so much Pam! I hope you do read it if you don’t win! But let us hope you do! What a fantastically clever idea to interview Mr Darcy!!!!!! Must say I really enjoyed it! Darcy seems rather desperate when we meet him at the start,understandably so. But with a little encouragement he begins to see a little chink of light and hope. Would love to read the exchanges between ODC,she on her sick bed,he holding her hand,cooling her fevered brow. Would love to read this book,thanks fur the opportunity to do so. Oh you have no idea! Hope IS light! And you haven’t even read the book yet to understand the metaphor! Wow! You deserve to win! How wonderful to read your interview with Mr Darcy, a closer look at his character and inner thoughts was delightful! I have to say a moment to see into Mr. Darcy’s thoughts is probably why most of us keep reading fan fiction! right? I know I’m right. He is not REALLY a fictional character. he is pretty darn real! After reading your interview with Mr Darcy I know that I must read this book. How sad yet hopeful. And demonstrating once again that he is a man of depth and integrity. I think I’ve read this story online a while ago. If it’s the story I have in mind, it was a pleasure to read! Thanks for the giveaway! Yes, I did post it in a few forums. But to tell you the truth, once my editor gets ahold of it, I go from an adequate story teller to a real author. And I totally give her credit. But I’m excited that you enjoyed it! It makes me so happy to hear that people might actually remember it after it has been so long. I’m pretty sure it was about 2 years ago. Congrats, Jenna! I loved MR DARCY’S PROMISE, and I just downloaded HOPE FOR MR DARCY. I can’t wait to read it, which will of course interrupt my own writing! Ha ha, I love it! Any good author, must first be a great reader. I totally believe that! In fact, I call my reading “research”.Prior to starting a new book, I read and read and read and read until I’m so packed full of ideas and appreciation for other author’s writing tools that when I finally start the book, it just takes off on its own! I would be honored if you used my book as “research”! Thank you! It is an interesting plot, for sure. I’m 100% positive that no JAFF has EVER used this plot twist in their book! So cool, to have Mr. Darcy to interview! Lovely idea for a differente post and way to present a book – i couldn’t stop myself from reading quick and laughing aloud, totally devouring the whole thing! How cool! Loved the conversation and the excerpts and so looking forward to reading this! Thanks for sharing.